A maintenance helper lost his hand as a result of an accident he suffered while disassembling a piston-type, gas-charged accumulator. He was asked by his supervisor to disassemble the accumulator. Having no idea what it was, and having no repair instructions, he decided to proceed with the task. He apparently figured out that the end-caps were threaded into the inside diameter of the cylindrical tube. To remove them, he fastened the accumulator in a vice. The vice gripped the outside of the cylindrical tube, holding it in the vertical position. He recalls it being difficult to screw the end-cap out. However, he figured this to be caused by an accumulation of dirt and oxidation in the threads. Having no idea what the depth of thread was, he continued to screw it out. Without warning, the end-cap blew out with a deafening explosion. It struck his hand, tearing it off at the wrist. What he did not realize, was that the device he was disassembling was a piston-type, gas-charged accumulator, with pressure inside. The reason why the end-cap was difficult to screw out was because the compressed gas was pushing against it. One could argue that the unfortunate victim of this horrific accident should have asked for help, or maybe asked for repair instructions. However, he had some experience repairing hydraulic cylinders. He figured that the accumulator was some type of "cylinder" since it closely resembled one. A number of years ago, I visited a ready-mix concrete truck repair shop, and stumbled across a mechanic who was welding the clevis on a tag-axle cylinder. From the number of times it had been welded, it was apparent that there was some kind of a problem with the system. An accumulator was installed in the hydraulic system to protect the cylinders from "road-shock" since the cylinders are used to hold the tag-axle wheels on the road. Pointing to the accumulator, I asked him if he had ever checked the nitrogen pre-charge. His response, "that's a filter from which I have never been able to remove the element." It was obvious that he had tried. I determined this by the jagged scars left in the housing from the jaws of a pipe wrench which he had apparently used to attempt to separate the two halves. Fortunately, it was a non-repairable type, and the two halves were welded together. Develop a safety standards committee for evaluating safety when purchasing new equipment. Have the safety standards committee evaluate existing equipment for safety. Have the safety standards committee conduct a market research study on what component/s and information is available to safely service and/or repair a gas-charged, hydraulic accumulator. Make the proper service and repair equipment available to maintenance personnel. Provide suitable training so maintenance personnel can learn how to use service and/or repair equipment safely and effectively. 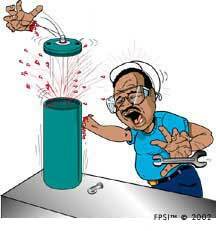 Discuss proper use of service and repair equipment in your safety meetings. Discuss medical complications associated with oil and air injection injuries. Write a Job Safety Breakdown (JSB) for correct techniques for servicing and/or repairing a gas-charged, hydraulic accumulator. Encourage team members to report non-injury accidents (NIA's) associated with servicing and/or repairing gas-charged, hydraulic accumulators. 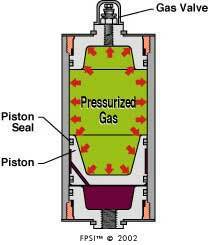 A gas-charged accumulator provides a unique safety hazard. Thus, it is recommended you develop an in-house "certification" program for team members who work with gas-charged accumulators. Only "certified" team-members should be permitted to service and/or repair a gas-charged, hydraulic accumulator.